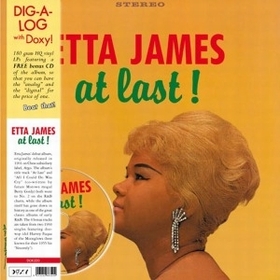 Etta James' debut album, originally released in 1961 on Chess subsidiary label, Argo. The albums title track "At Last" and "All I Could Do Was Cry" (co-written by future Motown mogul Berry Gordy) both went to No. 2 on the RnB charts, while the album itself has gone down in history as one of the great classic albums of early RnB. The four bonus tracks are taken from two 1960 singles featuring doo-wop idol Harvey Fuqua of the Moonglows (best known for their 1955 hit "Sincerely"). 180 gram LP and free CD of the album.